This is a proposal to introduce activist intelligence as a new multidisciplinary field of research. 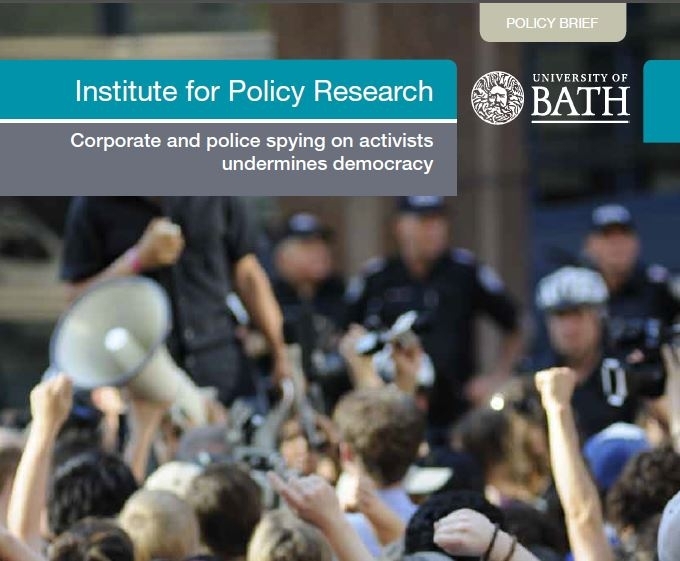 The first step is a one-day conference on issues around research into covert corporate strategy to influence public debate to be held at the University of Bath later this autumn. The exposure of Mark Kennedy as an infiltrator of activist groups made headlines early 2011. Confronted by friends and fellow campaigners in the UK, Kennedy admitted to having been a spy for seven years. Using the name Mark Stone, he had embedded himself in the environmental movement, while widening his scope to protests against the summits of world leaders, anti fascism campaigning and animal rights advocacy elsewhere in Europe. The Mark Kennedy story is an exemplary case, with the infiltrator as a facilitator – providing transport and money – while crossing the thin line towards the role of an agent provocateur. The coverage in the press was huge, and as a result of public pressure, half a dozen of official reviews are now underway. However, none of the official reviews into the Kennedy case investigates the aspects of corporate spying that make out the background of this operation. On closer inspection, the Kennedy case reveals the increasingly blurring boundaries between public and private policing and puts the grey area of corporate intelligence in the spotlight. The set of secret units Kennedy used to work for was founded explicitly to satisfy the needs of companies targeted by activists. What is more, the companies involved – such as electricity suppliers and airline companies – also hire former police and intelligence staff with long track records in monitoring activist groups to deal with security issues. The Kennedy case is in no way unique, it is just the latest exposure in a long line of similar stories of intelligence operations in the UK and elsewhere, conducted either by the police or by private contractors. And it will not be the last case. The Wikileaks exposure early 2012 showed how private intelligence company Stratfor was keeping taps on the Yes Men and their annual campaign for the survivors of the Bophal disaster. Closer to home, the Tobacco Control Research Group investigates the tactics of the tobacco industry and its allies to undermine the governments health policies. Denouncing NGOs such as Cancer Research UK and ASH as ‘health fascists’ is standard practice at certain internet fora, and only one of the many ways to get the pro-smoking message across. The internet as an arena to challenge corporate critics and to influence debates on crucial issues using false identities, is a field of research that is currently seriously underdeveloped. In short, this proposal aims to address the worrying trend of conjunctions between the state and the corporate world aimed at suppressing critical voices that are indispensable in a democratic society. Secret Manoeuvres in the Dark – the book. The research for my PhD (Strathclyde, 2010) focussed on intelligence and activism. It addressed the ways large corporations seek to manage and manipulate public protest. And it revealed the informal dimension of information gathering hidden behind the politics and practices of public relations and reputation management. My book, Secret Manoeuvres in the Dark, corporate and police spying on activists (Pluto, summer 2012), brings together a set of case studies examining corporate espionage, based on exclusive access to previously confidential documented sources. Each story is systematically unravelled to map the different aspects of the spying process. Detailing chronology, agents and strategy, each case is analysed as an actual intelligence operation, creating a new perspective on the events. The stories in this book highlight the privatisation of intelligence, and the increasing value of information as capital in power relations. The research reveals increasingly blurred boundaries between public and private in secret work, which, in my opinion, represents a potential danger to democracy. The book seeks to broaden the understanding of the policies of large corporations in their pursuit of power, and their efforts to avoid public debate and silence critics. At the same time, promoting greater awareness of activist intelligence is essential to enhance resistance to corporate surveillance. To develop activist intelligence and covert corporate strategy as a field of research, more detailed examples are required. However, original source material is – almost by definition – hard to access, maybe secret, and often difficult to comprehend. Intelligence operations necessarily take place in secret, under-cover. Data on such operations are confidential by nature, prepared for the client’s ‘eyes-only’. Discovery of proof behind stories and controversies that surface in the media is essential to put the events in perspective and understand the wider context. But new research needs to be initiated too. The importance of the issues at stake calls for a more active role for social scientists, investigative journalists, politicians and NGOs, and others concerned about the role of public protest in society. The field of research not only covers the gathering of information, but relates to the development of covert strategy as well. The stories in Secret Manoeuvresconfirm that the analysis of intelligence informs how the company deals with critics. This could be pro–active policy to stay ahead of possible problems, or to take action to prevent problems – or both. There is a need for research into what these policies entail. Of course, the wider context needs to be explained too. Why do companies chose to undermine their critics? How often does it happen? Which companies decide to employ covert strategies and what are the circumstances that determine such decisions? At what level in the company hierarchy is the decision to implement intelligence operations taken, and who else knows about it? A multidisciplinary approach would have to include aspects of globalisation and privatisation, the power of TNCs, the movement for social justice, civil society and the internet, PR and issue management, and intelligence studies. Mapping the world of grey intelligence would benefit from research into the political economy of the private intelligence agencies and consultancies involved, while the informal contacts of former agents require social network analysis. A deeper understanding of the grey area of activist intelligence and covert corporate strategy – and the extent to which it is integrated into wider policies of corporations under fire – would make a critical contribution to contemporary debates about the global political economy and governance, and opportunities for resistance in liberal democracy – a vital element in the field focussed on conflict and security . How to investigate infiltration, corporate spying and police surveillance? – the possibilities and pitfals of cooperation between activists, investigative investigators and social scientists; issues of privacy and security, trust and trauma, sourcing and ethics. What does a multidisciplinary approach to research the wide range of aspects of corporate covert strategies require? Should it include the following fields? What would be their involvement and their contribution? And which fields are missing? Such knowledge shares with the former the need to rely on non–rigorous and questionable data sources, the desire to raise issues, sensitise the public, and document problems, and a frequent reliance on individual cases. It shares with the latter respect for the logic of explanation and the need for empirical verification and generalisation. (Marx, 1984: 102). My book Secret Manoeuvres in the Darkaims to be the first of many of such hybrid publications aimed at understanding activist intelligence and resisting corporate counterstrategies. The new field of research could build on that, and expand the research network. Gary T. Marx (1984) ‘Notes on the discovery, collection, and assessment of hidden and dirty data’, in eds J.W. Schneider and J.I. Kitsuse, Studies in the Sociology of Social Problems, Ablex, Norwood, NJ.